I met Marshall at the market at 7 a.m. for some last minute preparation: tidying the shelves, setting up the weekend displays, cleaning, etc. The amigos got there around the same time to start grading and bagging apples. 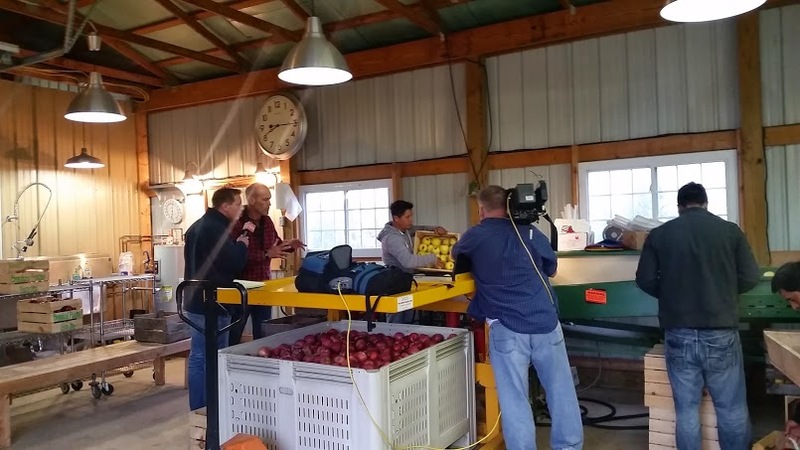 The first segment was about the apple-grading process and featured the amigos running Golden Delicious apples across the grader while Marshall talked about all the weekend preparation that goes into a Friday morning. 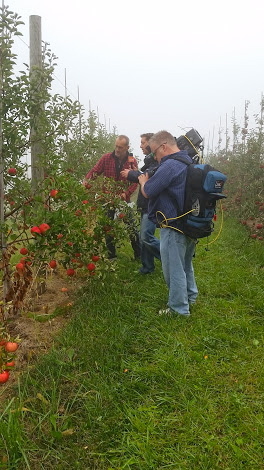 After the grading segment, we hiked out to the orchard northeast of the market. 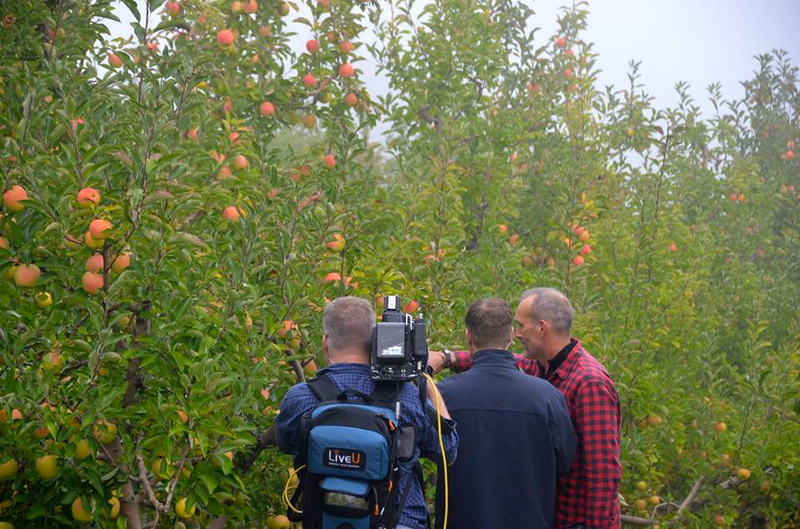 Our next segment was shot between two rows of our newer apple varieties: Florina and Topaz. Marshall discussed these apples in depth, and also offered pointers on what to look for when picking your own Topaz. For the third segment, we moved over to the west side of the market near our super popular Suncrisp apples and one of our pumpkin patches. Marshall covered picking tips for Suncrisp and why it's one of our most popular varieties, and he even demonstrated the proper way to crunch into an apple. 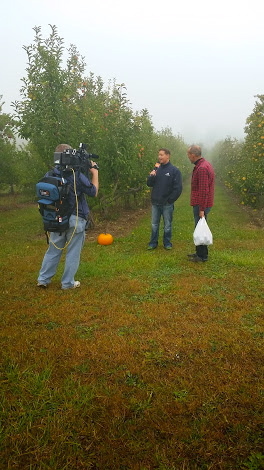 Dana even had a pumpkin from our patch on hand for a quick cameo. To finish up, we headed back into the market to talk about the various produce we sell and all the goodies we bring in from local foodies, like Goumas Confections and ToddleSquat Bakery. A couple minutes before Edwin was set to start rolling the camera, Marshall decided he was just going to sit this one out [read: throw me under the bus]. HOWEVER.. I totally lucked out. Just as my live television debut was getting started, there was an equipment malfunction, and I only had to suffer for a few seconds. 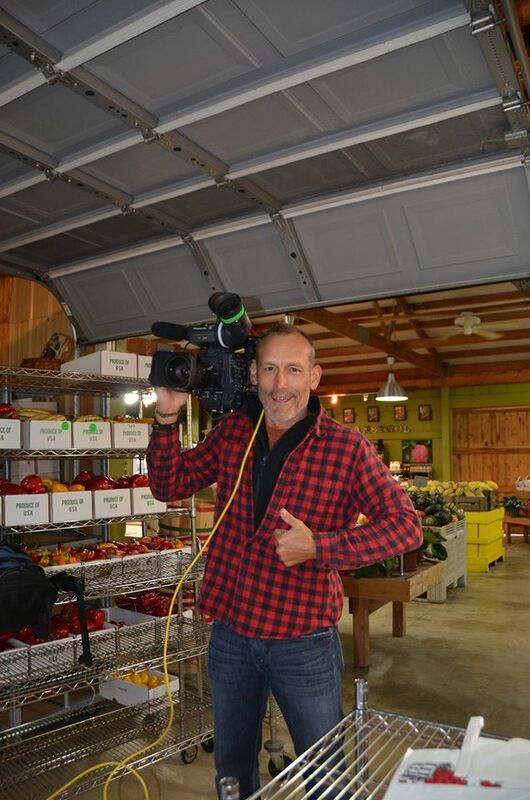 I was bummed that we didn't get those extra couple of minutes of exposure for Branstool Orchards, but I was plenty happy to get out of my segment. Overall this opportunity was great for us. We had a good time with Dana and Edwin, and Marshall did a fantastic job on the air - he was charismatic, comical and informative. Check out the videos for yourself!